Why is Kona coffee so darn expensive? A 2017 glance at Kona coffee retail prices shows options from $8 to $65 per pound. Contrary to the headline this actually sounds like a rather wide range where every market segment should be able to get their respective luxury-gourmet-coffee experience. Yet if one subtracts all the products coat-tailing on the Kona name (e.g. ‘Kona Blend, ‘Kona Style’, ‘Kona Roast’) the range is getting much narrower. Nothing below $28 per pound, which appears somewhat genuine is to be found. If any other specifics like ‘Organic’ or ‘Extra Fancy’ are being added the prices are going quickly towards the $45 mark and above. Yet in supermarkets one can get for five bucks a wide variety of ordinary coffees and see sale signs galore in the respective aisles. So who is getting rich here? And where is the discount stuff? Let’s take a closer look of what Kona coffee actually is. 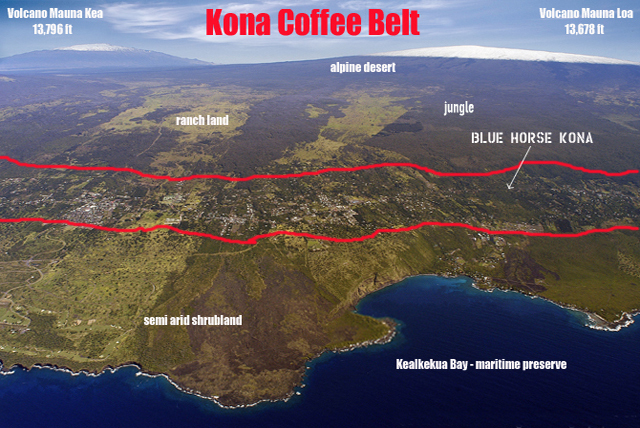 The fabled Kona coffee belt stretches for 20 miles with only 2 miles width through the districts of North and South Kona on the Big Island of Hawaii, USA. Ideal coffee growing conditions produce a very unique, highly aromatic, mellow, yet limited annual crop of the famous ‘kona typica’ beans. Mostly small family farms line the two roads winding along the fertile slopes of the active volcanoes Hualalai and Mauna Kea. The verdant green scenery with the blue hues of the Pacific below is occasionally interrupted by the signs of coffee processors trying to entice the local farmers to sell them their freshly picked coffee cherries: ‘$1,95 per pound CASH!’ or ‘BUYING CHERRY- Always Best Prices!’ (1 lb roasted coffee needs 6.5 lbs of coffee cherry). Also, once the harvest comes to an end, ‘BUYING PARCHMENT’ banners will flap in the gentle ocean breeze. What’s called ‘parchment’ is the now pulped and dried coffee, still in a thin membrane covering the green bean, which will fetch a price in the range of $10 - $14 per pound. (1 pound of roasted coffee needs about 1.5 lbs of parchment). So the base cost for a processor is btw $15-21 per pound of Kona coffee before storing, milling, sorting, roasting, packaging, labeling, marketing, shipping and labor costs are added. And that’s the key to understand the 100% Kona coffee’s economics: All local Kona coffee growers have the chance to sell their crop as cherry fresh off the tree or as parchment or green coffee. No additional work as pulping, drying, storing, milling, sorting, roasting, packaging, labeling, marketing goes into it. Many choose to do so, as labor costs in Hawaii are at a premium and housing for low wage workers is nearly impossible to find on the island. The actual Kona Coffee Belt land is too steep and rocky to navigate with machinery and hard human labor is needed to plant, grow and harvest. In addition harvests vary depending on annual rainfall patterns or damage by pests. Most farm parcels are only of 3 - 5 acres average size and are capable of producing 20 - 40,000 pounds of coffee cherry. Once the substantial picking costs (currently 65 cents per pound) are subtracted the annual monies earned can be considered only minimal. So the Kona coffee growers will usually round up their unpaid family, interns and friends to pitch in during picking season and then the numbers look somewhat better. However, no one has ever become rich farming Kona coffee! It is, and always will be, a labor of passion similar to the old fashioned wine ‘vintners’ backbreaking daily chores. And passion it is when a few of these traditional family farmers in the age of the internet are able to bring their product directly to the customers: No middlemen, no processors, no pooling of various farms, no store chains or roasters between the consumer and them. But even when the farmers do their own processing, packaging, shipping and advertising, these additional efforts will raise their profits only marginally--however, it does guarantee them independence. It’s added value for both parties, as customers know exactly where the beans come from and the farmer is able to care and maintain quality-control of the coffee from seed to cup. 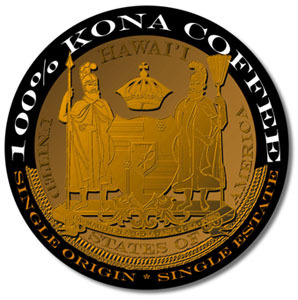 But since most folks have never tasted real, ‘handcrafted’ 100% Kona coffee, it then becomes very tempting for many large roasters and processors to bend the rules by labeling cheaper coffees as Kona, or by creating 10% blends, which are nothing more than a few Kona coffee beans thrown in with 90% cheap foreign beans. The growing market of single origin, single estate coffees (as a real Kona coffee should be labeled), is also flooded with impostor coffee brands. So please do your research and don’t always believe what’s written on the bag when buying Kona coffee. Know your farmer! Especially when the deal sounds too good to be true or it tastes like generic coffee, it most likely means that those beans haven’t seen Hawaii at all. And be especially careful in the treacherous market of EBAY's Kona coffees - the good stuff is often right next to the blatant fraudster. So why are we cheaper than most other Kona coffees yet have such a superior product? As a matter of fact, our life would be a tad easier if we would just take our parchment or even cherries and would sell it to the processors. But then farm life suddenly becomes boring and the pride we feel in our coffee doesn't mean a thing anymore. Plus the haggling and bartering for the best price with the few processors reminds one of the medieval dependency farmers always had. We are striving to get you as a longterm, happy customer, be able for you to talk to us directly and have a bit fun while doing it. There seems to be a lot of importance placed on coffee farms winning awards these days. Folks ask us sometimes what we have won so far. Well, we don't participate in award, or coffee cupping shows. Cowardice is certainly not the reason. Taste is highly subjective and has to be developed individually. Award shows however, attract a notoriously insecure customer base. They are gone with the next 'winner' of the next show. Our customers word to friends and colleagues is simply much better advertising. Participation, with the high chance of winning a Kona Coffee Award would also be unfair to our faithful regular fans, as limited production of a farm coupled with the high demand after winning, always raises prices steeply. And hence would irritate our steady supporters, who had discovered us on their own. We also noticed that Kona coffee farms are increasingly wooed to participate in new cupping shows, but mostly as sparring partners to ultimately praise some other, lesser known regions winner to 'have beaten prestigious Kona coffee'. That's plain silly, as there are many other great coffees all over the world. All waiting to be discovered by the inquisitive coffee connoisseurs themselves.